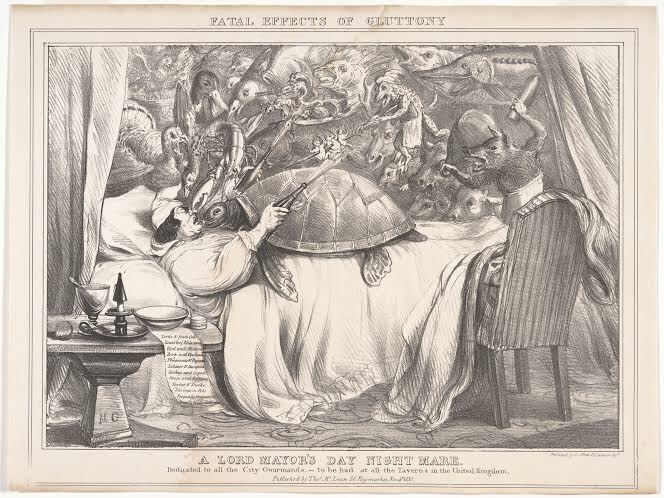 Published in 1830, Charles Motte’s political cartoon, “The Fatal Effects of Gluttony: The Lord Mayor’s Day Night Mare” features a British Lord Mayor haunted by dreams of his day’s meals. From fish to fowl to feral-looking deer, the animals that the Lord Mayor has consumed throughout the day are coming to exact their revenge, armed with weapons and murderous stares. The Lord Mayor is lying in his bed that conveniently looks like a dining table, pinned down by a massive tortoise, as a frog wields two opened champagne bottles as guns. A frog is standing on top of the bedside table, atop the day’s menu – filled with too many delicacies to count. The 1830s were a time of political and social friction in London, and the Lord Mayor’s Day highlighted these tensions. A celebration to inaugurate the new local Lord Mayor of London, Lord Mayor’s Day reinforced the Lord Mayor’s devotion to the British crown, a symbol of wealth and extravagance: two things that the upper class in London had plenty of, but the lower and rising middle classes did not. The gluttony of the Lord Mayor’s Day Feast was a visible division between the haves and the have-nots. The political cartoon begs the question: is the real sin here gluttony, or indulging in gluttony while willfully ignoring those who go without?